Maybe you’re thinking of opening a daycare center and not sure where to start. Maybe your child care business has grown too large for your home, and you want to expand into a dedicated facility. No matter where you’re at in your day care business, from planning to expanding, consider prefabricated metal buildings for your child care facility. The number one reason to choose a metal building for your day care center is cost. Simply put, a traditional brick or wooden daycare center costs hundreds of thousands of dollars to build, and that’s for a small center! Metal or steel buildings are significantly less expensive per square foot and have several other benefits. Because metal structures do not require the same interior support as a wooden-framed structure, you have limitless customization options. Whether you want to create an open interior for a larger, all-ages play area, or you want to create smaller spaces to divide by ages, you can design your own interior layout. Plus, as your needs change, you can change your floor plan without worrying about disrupting load bearing walls. Not only are metal buildings less expensive to cost, they are less expensive to maintain. Metal buildings can be heavily insulated, reducing heating and cooling costs. Plus, with a metal structure, you don’t need to worry about sagging, warping, or even termite damage, like you would in a traditional building. While wooden framed buildings with brick or siding exterior can take months to construct, a metal building is constructed quickly without cutting corners. From pouring the foundation to finishing the aesthetics, Champion Buildings can be complete within days of starting! Unlike wood that requires foresting and vinyl siding, stucco, and cement fiberboard that have leave large carbon footprints, steel can be easily recycled without affecting the integrity of the material, making it highly sustainable. Well-constructed metal buildings are designed to withstand hurricane-force winds while steel has the important benefit of being fireproof. Not only will this keep you, your staff, and your children safer, but it may decrease the cost to insure your building. Home daycare facilities are popular because they are generally inexpensive to open compared to buying an established facility or building a center out of traditional materials such as wood and brick. However, using your home immediately limits your business in terms of how many children you have the space to safely watch, putting a cap on your income before you even get started. Plus, your home is immediately taken over by your daycare – your living spaces are crowded with daycare gear, your yard is turned into a playground, and your private spaces are likely to become invaded. 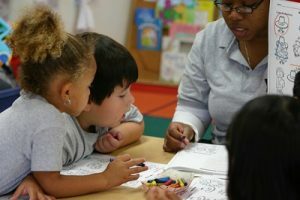 By having a separate child care facility, you can immediately stand out as a professional with an attractive, child-focused center that is easy to customize for safety guidelines and the needs of your clients. You also can earn a larger income from your center by not only charging more for a dedicated center but by having space for more children! Since 1999, Champion Buildings has worked with all types of industries and businesses, from retail and restaurants to churches and child care, creating customized metal buildings across the Mid-Atlantic and Southeast. Our open interiors give you the freedom to utilize your space exactly how you want, even partitioning spaces off to develop as your center grows! Best of all, we don’t just sell you a kit! We offer full, turnkey service in which our team will arrive at the site of your daycare center, lay the concrete slab, and erect the building to fit your customized design! We also offer an incredible selection of accessories and color options for your walls, roof, and trim. Keep it neutral or create a bright, cheerful exterior to draw parents and children alike! Are you interested in getting a prefabricated metal building? For more information or to purchase your metal building contact Champion Buildings by visiting our contact us page or calling us by pressing the button below. Copyright © 2019 Champion Buildings. All rights reserved.